Giulia Stellari. Photo courtesy of Giulia Stellari. When Giulia Stellari was seven years old she knew exactly what she wanted to be when she grew up: a sheep farmer in Australia. “I was really into animals and have always been into growing things, but lived in a very urban setting and so didn’t really have the opportunity to do that,” says Stellari. Even though she didn’t pursue this dream, she eventually got back in touch with her agricultural leanings in a very different capacity. 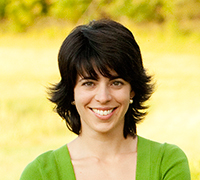 In 2009, Stellari cofounded AgSquared, a software company focused on small-farm planning, management, and record keeping. Stellari and her AgSquared cofounder Jeff Froikin-Gordon met at Cornell graduate school at a time when agriculture and big data were converging. The first plant genomes were being sequenced and these scientific advances encouraged graduate students like Stellari and Froikin-Gordon to start thinking about big data questions. “We became really interested in how farmers could use information to improve what they do on the farm and the overall sustainability impact that could have,” says Stellari. When they met, Stellari and Froikin-Gordon both had backgrounds in agricultural research. While earning her undergraduate degree in Biology from Harvard, Stellari researched the evolution of flowers and seeds and went on to work at the New York Botanical Garden researching the genomes of medicinal plants. Froikin-Gordon had studied farming in West Africa, an experience that became integral to the formation of AgSquared. Stellari and Froikin-Gordon began collaborating to uncover farm information management tools that could be used by farmers in West Africa. They soon realized, however, that small-scale U.S. farmers weren’t faring any better than their West African counterparts when it came to information management. This discovery prompted Stellari and Froikin-Gordon to immerse themselves in farm records, books about planning and management techniques, spreadsheets, farm notebooks, and anything else that could help them figure out what farmers needed in a farm management software. The fruit of their labor was AgSquared– a comprehensive and affordable software program that would streamline the way small-farms do business. Today, over 8,000 farms use AgSquared software to plan their seasons, track their harvests, track their labor costs, track their production costs, and more. Stellari is happy to help farmers on this very practical level, but she also recognizes that by doing so, she is having a much broader impact. “I enjoy the opportunity to make a meaningful impact on a day to day basis for people who are doing really hard work that is so good for their local communities and the global community as well. The fact that I help support and sustain that, even in a small way, means a lot to me,” says Stellari. Stellari is also grateful she found her way back to agriculture, a field that inspired her from a young age. She remains optimistic about the future of AgSquared and about sustainable agriculture’s potential to transform the world. It is this optimism that keeps her loving her job as President of AgSquared.